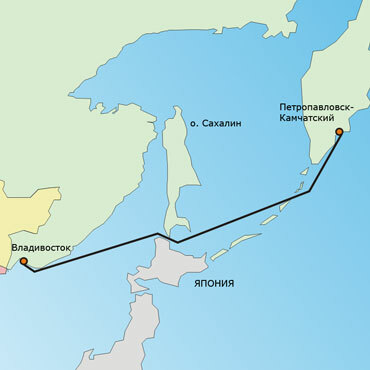 In April 2011 SASCO new liner service from Vladivostok to Petropavlovsk-Kamchatsky was opened. Three SASCO liner vessels are operated on the line now. Vladivostok is one of the biggest ports of Russian Far East, administrative and industrial center of Primorsky region, and one of the biggest Russian Far Eastern towns. Vladivostok is a key station of Russian Far Eastern Railroad as well as terminal point for Trans Siberian Railroad. Petropavlovsk-Kamchatsky is an administrative center of Kamchatka Kray, it lies on the north-west of the Kamchatka Peninsula, on the coast of the Avacha Bay of the Pacific Ocean. The port is situated in the downtown and can be entered by vessels all year round. In July 2011 the 50th birth in Vladivostok Sea Container Terminal was detached under long-term partnership agreement between Fishing Port and SASCO to support SASCO liner tonnage on Vladivostok - Petropavlovsk-Kamchatsky and Vladivostok - Magadan services. This has made possible to reduce handling time of SASCO vessels and to more efficiently allocate warehouse space by accumulating all domestic cargoes at one place. Sorry! Schedule is not available now! Please visit us later! Refined data are available on this page.